Our lives are so technology dependent today that imagining even a simple task without the help of an electronic device would be very tough. Similarly, one area where its influence is increasing daily is learning. By this, we mean that learning as a whole, for students, working professionals and everyone. Gone are the days of simply learning things via classrooms and through conventional lectures, today you can pick up new subjects and skills through the comfort of your home. E-learning, as it is colloquially referred to as is perhaps the easiest and adaptable way to learn subjects and pick up skills. You can learn from anywhere in the world so long as you have access to a computer and an internet connection. The modules and classes are all uploaded online and stored in cloud servers for easy usage. You might think it sounds so easy, just make a lecture and upload it. This is quite a big misconception as you will need other relevant content along with the subjects in order to have a feasible learning system. But you will need to learn the make the content yourself and hence there is the requirement for content authoring and specialised tools. There are various kinds of tools on the internet, but the best ones are the ones which are usable on a browser. This means that you do not need to download any extra applications or software on your device. • Timeline based construction: So you can make your modules based on the timeline, by simply placing objects and defining actions, this makes your job easier as you can now divide your time accordingly. • HTML5 and CSS3: Using these two web building software, which can be run on virtually every single device on earth. This allows for your modules and classes to reach the masses. • Multiple device compatibility: With a good authoring tool, you can easily compile your content and publish it across different devices, without having to worry at all about the device size and other miscellaneous details. • Multi-platform ease of usage: You can publish all your learning content at the click of a button across all platforms, be it windows, android or macOS and iOS. • Audio syncing: This can be quite the hassle when using videos and animations, so your priority is to find a website which has a good audio syncing software tool. 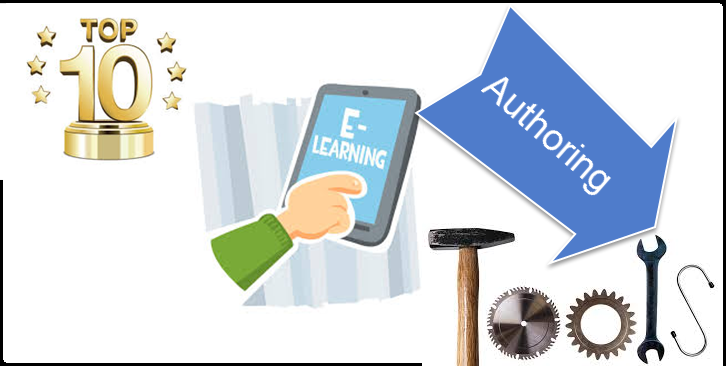 With the help of top e-learning authoring tools, you can take your website and learning the material to new heights. With an ability to reach audiences all over the world, e-learning is the next step in the right direction.